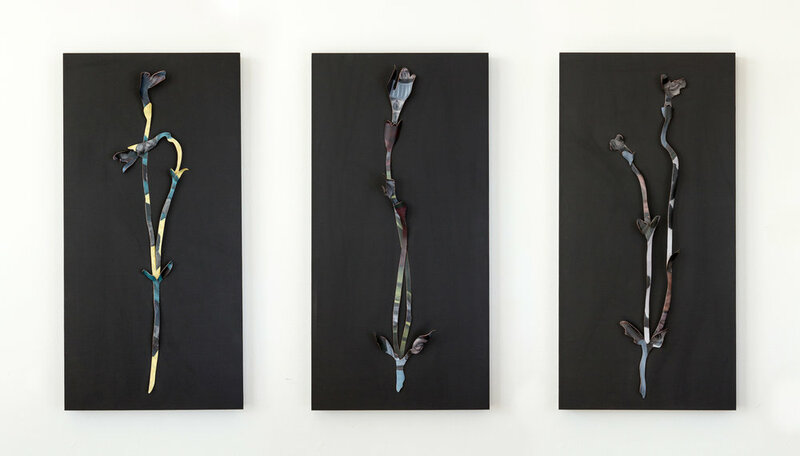 This body of sculptural works embodies my continued exploration of paint on metal, and investigates how certain traditional methods of both painting and metalsmithing are altered and/or appropriated in effort to merge the two disciplines. My process begins by applying paint directly on a flat sheet of copper. When the painting is complete, the imagery is deconstructed and obscured using traditional metalsmithing techniques to manipulate the copper sheet into three dimensional forms. Several of the pieces in this body of work are directly inspired by the uncovering of my childhood flower press from nearly twenty year ago. Inside the press I found pages of paper-thin flowers that were perfectly preserved, almost as if frozen in time. I became consumed by the way in which the contents of the flower press had remained relatively unchanged over twenty years while the world outside of it continued to change and transform. The notion of pressed flowers as mementos -markers of time and place- became deeply fascinating to me. In this body of work I draw upon various flora as metaphors to hold close people, places, and feelings from the past while exploring subjects of fading memory, loss, and transformation. The presented ambiguity between jewellery and object, function and decoration is amplified by the fragmented painted imagery that quietly masks the metal surface of each form. Although the mind may wish to untangle the pieces and restore order, I seek to embrace the intended state of uncertainty. It is in this ambiguity that traces of different disciplines can cross, tangle and dissolve, and move into a new context with greater clarity. Over the past few years, my practice has focused heavily on merging my longstanding interest in painting, and my formal background in jewellery design and metalsmithing. Through extensive material research and exploration, I have sought to challenge what is familiar to both disciplines, and to investigate how they can merge to create something new. 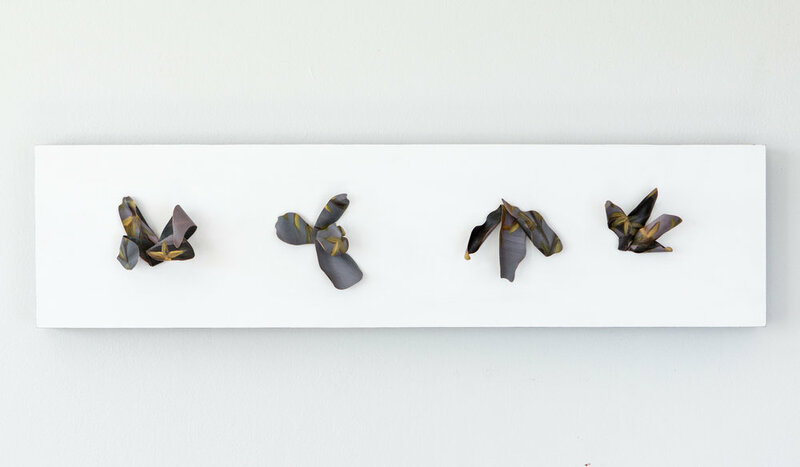 I began to remove my work from the context of the body in order to focus on transforming my paintings on metal into more sculptural, three-dimensional forms. 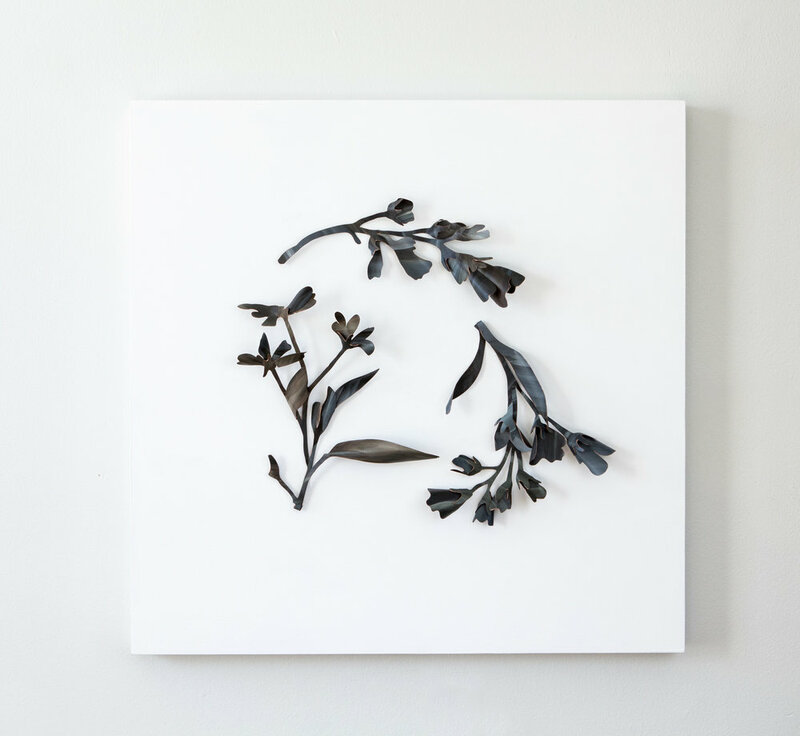 I often start by deconstructing my paintings on metal into a multitude of tiny shapes which I form and connect using traditional metalsmithing techniques. Painting directly on thin sheets of metal allows the actual structure of a painting to be easily manipulated, creating a stronger unification of mediums. Through exploring a more sculptural realm, my work has started to become part of a new context, although the details and intricacies of each piece are sure evidence of a jeweller’s hand. A special thank you to the Ontario Arts Council for their support of the research and creation of this work body of work. Traces, a sculptural installation for the Toronto Offsite Design Festival, 2018. Traces, copper, paint, wood, 2018. On the east coast of Canada there are tall grasses that grow near the coastline known as marram grass, a hardy plant species that stabilizes sand dunes. The grasses are thick and lush in the warmer months and weather into golden strands as fall and winter set in. Repeated gusts of harsh wind off the water carve ghostly patterns through the grass. The windswept grasses bear visible traces of the wind’s course and become a humble reminder of the elusive and untameable force of nature. Traces is a sculptural installation made up of more than thirty small paintings of coastal landscape on copper that have been cut into thin lengths that mimic weathered marram grass. The imagery of the original paintings form deconstructed and obscured imprints of the environmental conditions of the coast. Opaque brushstrokes and controlled hints of metal blend together to conjure echoing sounds of the ocean, while forming a static snapshot of faded memories. Although marram grass can withstand extreme coastal weather and tolerate human encounter, it always seems to carry visible traces of all that passes through.